In 1896 Svante Arrhenius and Thomas Chamberlin evaluated that human activities would provoke an increase of global average temperature due to the production of high quantity of carbon dioxide. This prediction was ignored until the 1980s when the global annual mean temperature curve started rising steeply. Then, many scientists started pointing at it as the main cause of the global warming. This had lots of repercussions on the environment, especially on the polar regions. 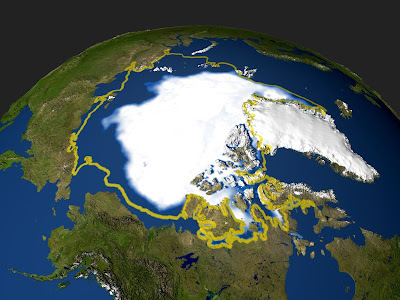 Massive amounts of ice vanished from the polar caps and others are still melting. The most obvious example is the North pole where almost the 22,8% of the iced surface is liquifying . The maximum extension was 14 million squared kilometres and it was reached in march 2015 . The lowest winter area ever recorded . According to some researchers the point of no return will be reached almost in a year with irreversible and unpredictable consequences. The region is getting the attention of many countries, especially from those that are limped by the Arctic Sea. The biggest contenders are Russia, Canada and Denmark that are competing for the increase of their continental shelves. Briefly, a continental shelf is the part of the landmass of a country covered by ocean. Maritime confines of nations usually reach the 200 miles from their own coast. Instead, in this case, the different states are trying to obtain as much territory as possible to exploit all the resources beneath the surface. However, they have to present geological evidence that their shelf effectively extends beyond the 200 nautical miles limit to the CLCS, the UN “Commission on the Limits of the Continental Shelf”. WHY IS THIS AREA SO CRAVED? During the last decades, many researches located and quantified many hydrocarbon deposits. Sure enough, the liquefaction of the arctic cap makes possible to build platforms to extract these resources in that area. Furthermore, new trade routes will be opened. After all quicker connections with the Far East will be acquired and the arctic nations will gain from it. A greater number of ships will cross the internal waters . As said, the most determined nations are Russia, Canada and Denmark. In pole position there is Russia (check out THIS video to learn more), followed by Canada. Norway and Denmark with Greenland have already approved their territorial claim . 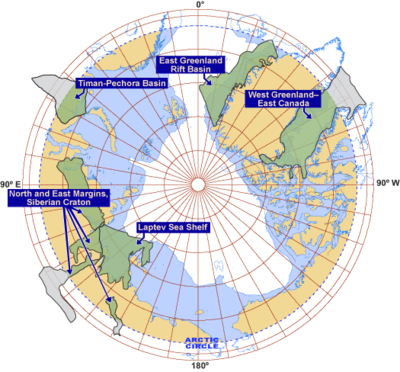 CANADA: have announced that it would file a claim, which includes the North Pole. 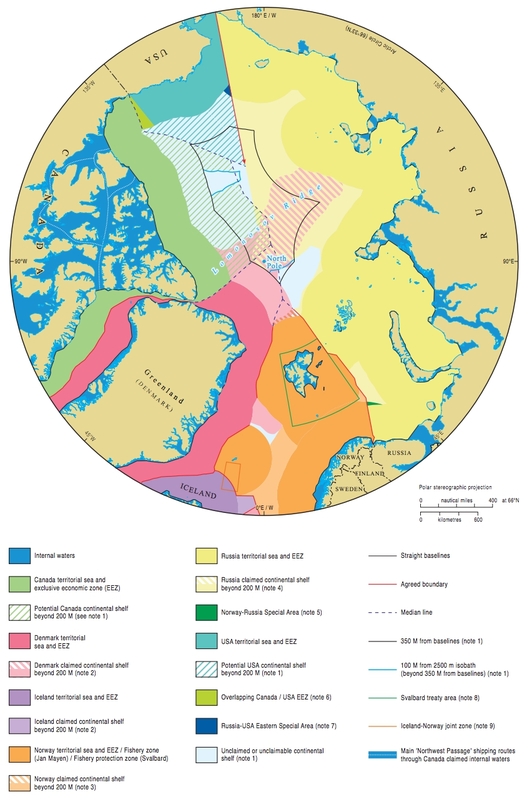 Canada is going to plans submit their claim to a portion of the Arctic continental shelf in 2018. Canadian scientists base the claim on underwater mountain ranges stretching under the Arctic Ocean from Canada to Russia called Lomonosov and Alpha-Mendeleyev Ridgesm. This give them the right to demand the seabed under the North Pole. Moreover, they are starting promoting their actions to the citizens with propaganda campaigns. 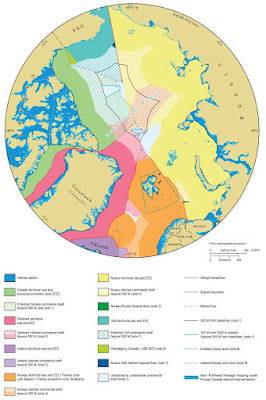 DENMARK: in 2014, Danish geologist successfully obtained the extension of their continental shelf of 895,000km2 as previously stated. They claimed that the Lomososov bridge is the natural extension of the Greenland. As a matter of fact Greenland is under the Danish monarchy though it’s very independence. Thanks to this the claim grant the nation a region 20 times greater than the actual Danish border. NORWAY: it was the first nation to get its demand approved in 2009. It was possible because of the various islands and archipelagos outside the landmass of the state. The expansion is greatly caused by the two main overseas territories, Jan Mayen and Svalbard. Although the majority of these countries are worried about the consequences of the global warming and the consequent disappearance of the arctic cap, it’s interesting to notice how they are taking the greatest benefit from it. MATTEO P. & MATTEO B. Kudos for a great post, Matthew & Matthew!